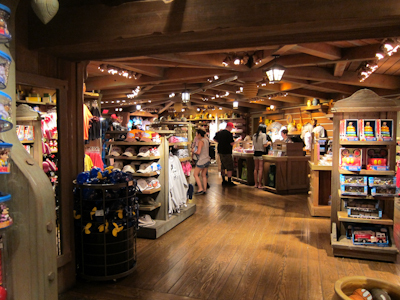 As I said before, there’s not a lot in Critter Country–two rides, two stores, and a restaurant. As such, I rarely make it all the way back there unless I’m going on Splash Mountain. And to be honest, I don’t go on Splash Mountain very often, mainly because I don’t like walking around all wet unless it’s really hot out, and most of the time it’s hot out my pass is blocked. 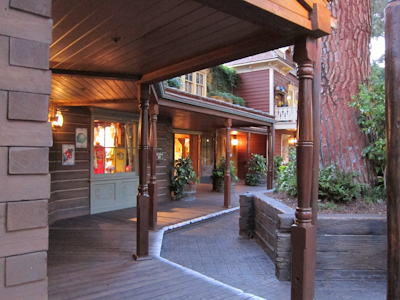 Plus it was closed for refurb for like the entire winter and just recently reopened. 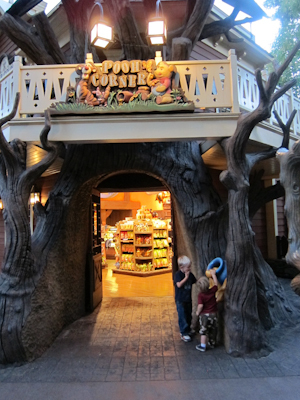 Anyway, so not being back in Critter Country very often means that I haven’t been back to the Pooh Corner store (oh I forgot–there’s also the Pooh and Friends meet and greet there too). 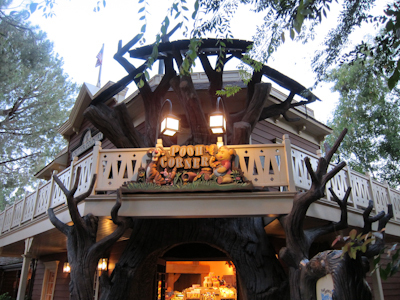 In fact, I didn’t even know it was named the Pooh Corner Store. Because it’s not. 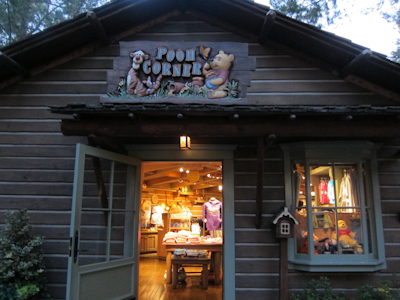 It’s just named Pooh Corner, which sounds all friendly and all until you realize that A. A. Milne’s version of Pooh Corner did not involve merchandising. And the whole thing is all inside a tree! In true Disneyland fashion, the theming goes all the way to the sky. I like the details above the entrance. There are two parts of the store–actually I think it’s two stores, but anyway, I will refer to them by their technical names, “The Right Side” and “The Left Side” based on where they are located as you’re looking at the middle. The Right Side is extensively Pooh-themed. This is the section I haven’t be in in forever. Which brings me to another thing I didn’t know existed–Pooh Corner has a candy-making window. Wow! When did they put this in? 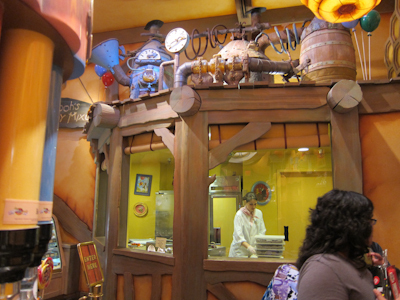 There’s another candy making window on Main Street (which I formerly thought was the only one) and that has always been one of my Top 3 desired Disneyland jobs (the other two being a Jungle Cruise Skipper and a Tour Guide). I don’t know why. In reality, standing there making candy for the entire shift is probably a lot of work. But maybe it’s just something leftover from childhood where wow, making CANDY ALL DAY LONG!!!!! seems really cool. 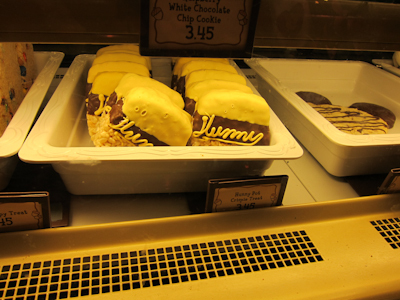 And Tigger Tails, which are a stick with marshmallows covered in caramel, orange-colored white chocolate, and drizzled with milk chocolate. And crack. 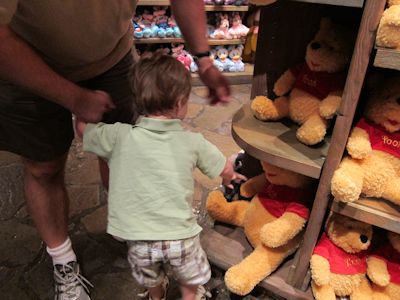 Pooh Corner also has a stuffed animal section, and first I need to talk about Theo and his Pooh Bear. This is a man who loves his Pooh Bear. 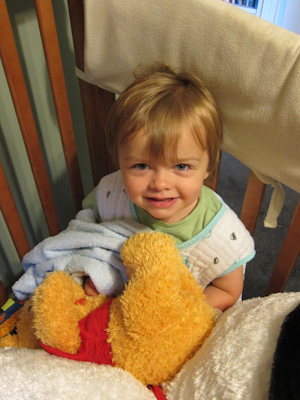 He has three sleeping companions–a stuffed duck named Duckie, a blue blanket named Blanket, and a Pooh Bear. All are an integral part of sleeping. 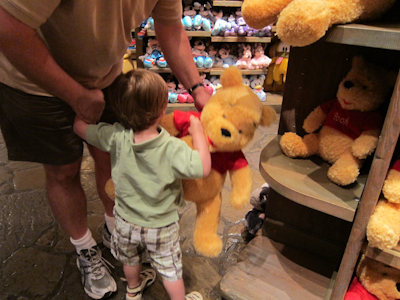 We’re going to get a travel-sized Pooh Bear before we go anywhere else. Pooh Bear! Pooh Bear! Pooh Bear! Pooh Bear! He insisted on holding one of them. Hold it? Hold it? Hold it? He wasn’t really trying to steal it. It was like he thought that his own Pooh Bear had been strangely misplaced but it was okay, Theo was going to take him back home again. Which in Toddler Land makes perfect sense. After the joy and delight that is The Right Side, you move to The Left Side, which is kind of disappointing. It’s really just your standard-issue merchandise without anything particularly interesting. The outside of The Left Side isn’t as cute either. In between the two sides is a quaint porch area. 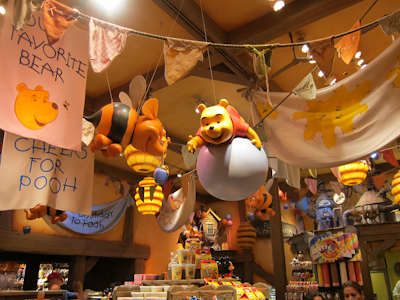 Even if you’re not a Pooh fan, it’s worth your while to go check out Pooh Corner. I’ve only had a Tigger Tail once, but it is delicious. Very sweet, but also very good. I always forget about them though, particularly when I’m stuffing my face with popcorn and churros, but I’ll try to remember next time and take a picture for you. Shelby, how did you separate Theo from the Pooh Bear he picked up in Pooh Corner? This may be my new favorite post! ❤ Theo!! When we were at Disneyland on Monday, my mother-in-law kept our DD while we rode Splash Mountain. While they were waiting our DD spotted a large pooh bear in the decoration window. 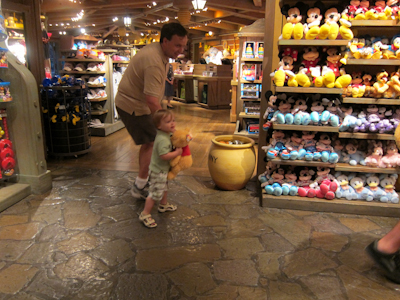 Apparently she spent several minutes standing on her tiptoes trying to reach through the glass to get the Pooh bear. I explained to my MIL that she has a smaller version of that same bear at home that my mom bought for her when we visited Disneyland in June. (She also has a larger, but different version, of Pooh bear that she LOVES. When we returned from Disneyland in June she carried it around with her for quite a while.) Anyway, I assumed like you, that she thought that was her bear and was just trying to rescue it. We have two mostly-identical stuffed Pooh bears that my kids used to play with. I say mostly-identical because one of them has a heavier brow than the other one, which partially blocks his eyes and caused my son to call him “Angry-eyes Pooh” when he was young–20+ years ago, now. And the thought still makes me laugh.